Let’s face it: investing can be a pretty lonely journey. Poring over the Wall Street Journal, reading prospectuses, monitoring your brokerage account . . . these aren’t the kind of activities your college buddies are eager to come over and do with you. But what if they could be? It’s not impossible. 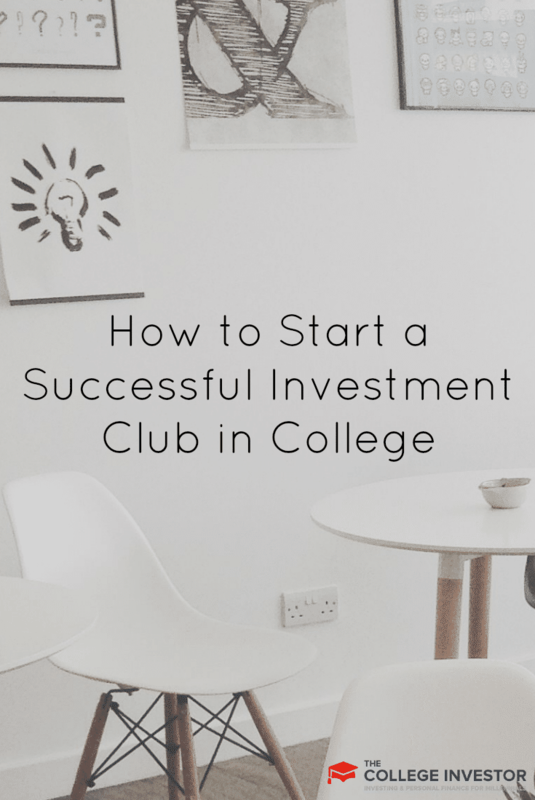 By forming an investment club, investing can be transformed from a dry, solitary task into a fun social event — something you and your market-minded friends look forward to every single week. It can also enable you to earn much higher returns than if you were investing alone. An investment club is exactly what it sounds like: a group of friends who pool their money into one large pot to invest together. Your club can be as basic or advanced as skill level permits. If you and your friends are beginners, eager to learn more and test your theories, the club will be a terrific avenue for doing that. If you’re all experienced Wall Street traders, the club can become a sort of “mastermind group” where iron sharpens iron and makes everyone even better. You can meet as regularly or infrequently as you like, charge whatever level of monthly dues you and the other members are comfortable paying, invest conservatively or aggressively, etc. It’s truly up to you! Make no mistake: starting an investment club won’t make you rich overnight, nor is it a guaranteed path to eventual wealth. Nothing can completely eliminate the risks inherent in investing. What an investment club can do is spread the risk across the entire group and allow everyone in it to benefit from the shared intelligence of the other members. Confidence — Setting forth into the unknown world of investing can feel much safer with the support of trusted partners than going it alone. The risks will be shared, rather than born solely by you. Low start-up capital — Investing might feel fruitless if you only have $20 or $50 per month to work with. But if you partner with five, ten, or fifteen people, you’re part of an investment pool that offers the potential for much higher returns. Furthering your investment education — Investing in groups dramatically enhances your investing knowledge, because you will never be able to act alone. Rather, you will always be asked to explain and justify your investment suggestions to the other group members, consider their criticisms, and refine your strategies to perfection. Socializing — The world is filled with the girlfriends and beer buddies of investors who couldn’t care less about yields, risk-free rates, or index funds. But when you start a club, every member is just as passionate about investing as you are! In addition to benefiting from their knowledge, you’ll also be able to freely discuss what you love. Inspiration — The best investment opportunities don’t knock on your front door and ask you to capitalize on them. They can emerge from the spirited debates of your investment club if you devote time/attention toward cultivating it. Let’s go back to the “mastermind group” analogy I used earlier. Why do people join mastermind groups in the first place? Certainly, the reasons above factor in. But they often are not the primary reason. Mainly, it’s about accountability. It’s easy (because of human nature) to procrastinate or cut corners when it’s just you doing something. No one’s watching. There’s no peer pressure to stick to the goals you outlined for yourself, no one checking in on your progress or expecting to see results. Mastermind groups eliminate that right from the get-go. Beginning with the first meeting, you will be surrounded by a self-selected group of investors just like you — people who are serious about the club and fully committed to its success (rather than letting it become one of those half-hearted projects that gets “talked about” for a month and then forgotten). Are you the kind of person who feeds off the energy of a group? Do you find it easier to go to the gym with a partner than by yourself? Do you prefer bringing a knowledgeable friend or relative with you for major purchases? If so, forming a club could be the best overall investing decision you ever make! Having touted the many benefits of starting an investment club, I also want to be straight with you. Simply forming a club is no guarantee that it will be successful. In order for your group to reach its full potential, it can’t be a random social hour that you and your members do whenever you feel like it. Shared goals — The best investment clubs have shared goals, a unity of purpose that keeps everyone moving in one direction. Keep this in mind when forming your own club. If half the members are in it for the educational experience while the other half cares solely about making money, the same tired arguments will come up constantly and stall progress. Regular communication — In some sense, an investment club is no different from a marriage, business venture, or other partnership. When communication breaks down, the entire group can dissolve. That’s why it’s important for the members to be in close contact with one another on a regular basis. Otherwise everyone forgets the goals they share and starts taking the club less seriously. Scheduled meetings — Procrastination feeds on vague commitments. If there are no scheduled meetings, they simply won’t happen — guaranteed. To avoid letting your club fall into disorder and neglect, make sure you have a firm schedule for meetings (whether it’s two times per week, once per week, or whatever is most convenient for everyone). Specificity is more important than frequency here. Accountability checkpoints — Just like any business, your investment club can bleed itself dry from loss if no one is monitoring financial performance. Someone in your club should be responsible for issuing regular reports about all club investments, including profit/loss and other important metrics. 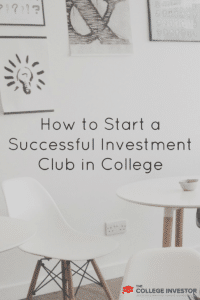 Were you part of an investment club in college? What about now? Do you have any interest in starting one? I have never been a part of one or even heard of one prior to now. I can see it being a great tool for people who are brand new to investing. I don’t think I would ever want to do it, because I don’t want to be accountable to anyone else when it comes to my money. If I started an investing club, unfortunately it would be very short lived. I’d simply bring a book like the Bogleheads Guide to Investing, or The Coffeehouse Investor, and explain the benefits of index fund investing. The 2nd meeting would have zero attendees. What a fabulous idea! I wasn’t part of one in college and I’m not part of one now. I had considered looking up a group of people on meetup.com to join to discuss financial things like investments. Not many people want to talk about it! I was part of an investment club right out of college. I learned a few cool things from others but overall, lost more money than I would have in just a broad market ETF. I consider it paying for experience but I’d never expect to beat the market. Plus there are hassles with partnerships, taxes, etc.